On this special birthday episode, Kevin celebrates his 39th while the TrekQuesters welcome Andy, one of their oldest and best friends, to the show. Andy picked an interesting episode for his virgin podcasting experience. Between the “penal colony” jokes, the stoned asylum inmates, and the various forms of hypnotic suggestions, we barely knew what to think of this show. For the second week in a row, we’ve got a galaxy-reknowned scientist who turns out to be on an evil quest to control mankind. Last week, the scientist wanted to turn everyone into androids. This time, he wants to turn everyone into mindless stoners. Which path would you prefer? Of course, at the heart of the story is Dr. Helen Noel. For the second week straight, Kirk gets to kiss the girl, and boy does he like it. Although Dr. Noel didn’t drive the same hotness scores as Andrea, she put on a good showing for the TrekQuesters, particularly when “escaping” through the woman-sized ventilation shaft. Of course, Kirk’s kiss has nothing on Spock’s first mindmeld, when he gets a little too up close and personal for Andy’s tastes. 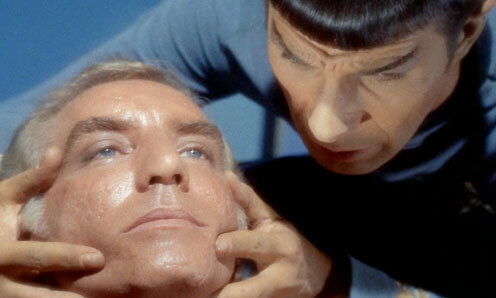 Would you like Spock to meld your mind? Could you survive inside a giant drug canister? Are all scientists completely insane? Let us know your thoughts in the comments or send us an email at StarTrekQuest@gmail.com.